Get your first look at Windows 7 and see how much more productive and efficient the development life cycle can be. Guided by three Windows programming experts, you'll examine new Windows 7 capabilities and get a head start exploiting them to build better user experiences and applications. Topics include multi-touch gesture support, graphics and video enhancements, the Ribbon user interface (including the difference between Windows 7 Ribbon and Windows Presentation Foundation (WPF) Ribbon), federated search, the Libraries feature, Taskbar functionality, the new Windows Sensor and Location platform, and more. Yochay Kiriaty is a Senior Technical Evangelist at Microsoft, focusing on Windows 7. He has more than a decade of experience in Software development, and is the public face of the Windows 7 Developers Blog. 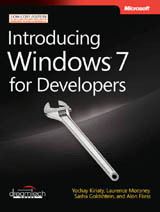 Yochay has written a number of MSDN articles, and co-authored Introduction to Windows 7 for Developers.